Araucana chickens are a South American bird originally from chile. They are best known for being the progenitor of the Ameraucana and Easter Egger. Araucanas are a fairly rare bird due to a genetic deformity that causes many to die during incubation. 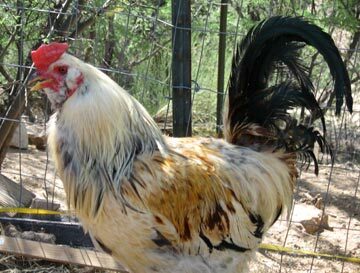 The Araucana has a beard, ear tufts, and can have a tail or not tail. They lay a large number of eggs in various shades of light blue. Araucanas are grouped into two categories, the United States and the United Kingdom. The United States group describes the Araucana as having a variety of colors, ear tufts and is tailless. The second group which is in the United Kingdom describes them as having a beard, ear tufts, and can have a tail. Both categories have a small pea comb.